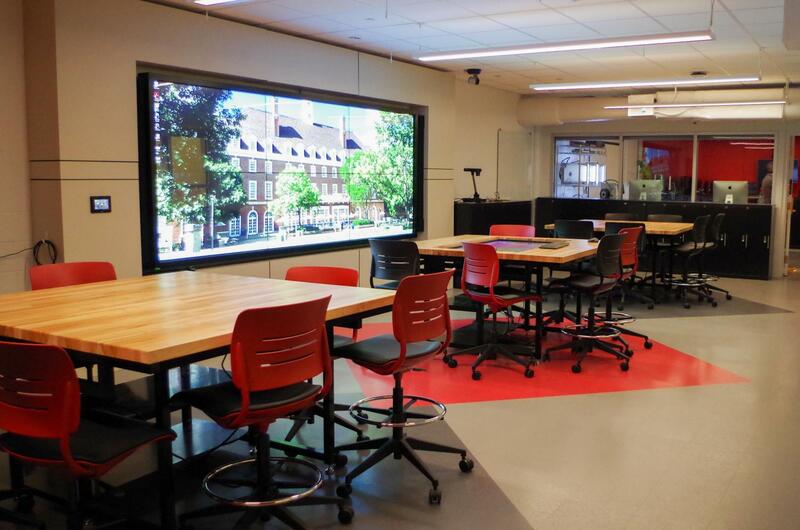 Glass-paneled walls, connectable screens and movable furniture are premiering in renovated classrooms at the Armory this semester. The Center for Innovation in Teaching and Learning worked with different disciplines across campus to help develop these innovative classrooms that focus on enabling faculty to teach more effectively, and to give students an outlet to engage in more productive learning. The northeastern part of the Armory building was under construction for the majority of the spring semester 2017 while classrooms were being developed. There is now an official iFLEX classroom, an Innovation Studio, a Virtual Reality Lab, a TechHub and an open-air office. The TechHub is where faculty, students and the public can come to view and test new, emerging technologies. The space is very hands-on, with exhibits throughout the room that people can engage with and learn about, such as a student-developed augmented reality exhibit. MakerGirl, an organization aimed at getting girls interested in coding, is partnering with the University to host their camps and sessions. In return, the TechHub will be housing their 3D printers. Jamie Nelson, Senior eLearning Specialist, said they hope they’ll be able to partner with other manufacturers in the future to show off other emerging technologies. Two other new Innovation Spaces were added to the Armory: a Virtual Reality Lab with full room configuration and an Innovation Studio, equipped with six wireless, multitouch video walls and an interactive touch table. Illinois Flexible Learning Experience, or iFLEX, classrooms focus on helping to foster a creative and adaptable learning space, with multiple locations all over campus. These include: Huff Hall 209, Education 166, Armory 432 and Animal Sciences Lab 131, with Armory 182 being the newest addition. Director of the Center for Innovation in Teaching & Learning, Michel Bellini, said that it will be important to partner with faculty to learn about the different modalities of experiential learning, to help them further develop and adapt these classrooms for instructor and student benefit. Ava Wolf, eLearning professional, said that the iFLEX classrooms feature three aspects that distinguish themselves from typical classrooms. According to Wolf, the classrooms feature mobile furniture, with chairs and tables on wheels, which enable the instructor and the students to reconfigure the furniture quickly and easily for different teaching purposes. Wolf said they also feature an increased amount of writing surfaces. There are glass panels and white boards all throughout the room to help foster breakout activity in small groups and discussions. The final and most prominent distinction of these classrooms are the increased and enhanced technologies, according to Wolf. There are monitors mounted around the room for increased visibility, so students can easily view a monitor from wherever they’re sitting in the room. This semester there are eight courses being taught in the Innovation Studio and new iFLEX classroom in the Armory, with approximately 200 enrolled students in total. The courses offered in these classrooms range in disciplines from Global Studies, Grand Challenge courses, Informatics, Advertising and more. The other four iFLEX campus classrooms are home to over 1500 students across 45 different courses. Wolf referenced research done by the National Association of College Employers which concluded that recent college graduates lacked critical workplace skills such as collaboration ability and creative thinking. She said it set off a type of alarm within the world of education. Wolf said there are a wide variety of tools and approaches that integrate technology very effectively into teaching. Faculty are encouraged to use whatever amount of technology they’re comfortable with in the iFLEX classrooms. It affords instructors to be able to share documents easily with students, share individual work with the class, construct graphics and more fully engage during class. Bellini said that all of the new spaces and classrooms have been developed with students as the focus, so that they ultimately get the most out of their education.